When pondering what THE dream job is, Google would certainly be on top of the list. 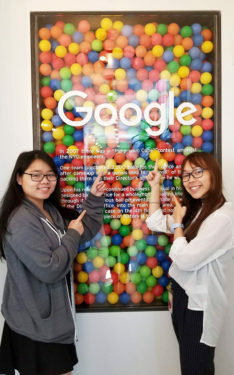 This summer, from July 17 to Aug. 4, I was fortunate enough to participate in Google’s three-week intensive computer science program designed for 30 high-potential, incoming college freshmen, called the Computer Science Summer Institute (CSSI). Walking in through those doors on the corner of 8th Avenue and W. 15th street on Monday morning, July 17, I didn’t know what to expect. My heart was racing from excitement and my mind was filled with questions. Will I like it here? Will I fit in? Do I belong? How much will I learn? I was so glad that I had my best friend and fellow Kearney graduate, Anita Chu, by my side. Going up on the elevator to the 14th floor to what would be my classroom for the next three weeks, I let my eyes wander and absorb my surroundings. The first thing I saw when I exited the elevator lobby was scooters. The lead instructor who assisted us to our floor explained that Googlers used scooters, instead of walking, to get to meetings when they were running late. I could already tell that my fellow classmates, who were also on the elevator with Anita and I, couldn’t wait to use them. We then walked through a micro-kitchen which had snacks, beverages, candy, fruit, cereal and more. Once we found our seats, I saw how nervous everyone was. What I didn’t know was that by the end of the program, almost everyone in the room would become my friend and some would become my close friends. Google has given me memories of a lifetime – ranging from the view of the city, the food, the Pac-Man-themed floor, LEGO micro-kitchen, game room, Google Earth room, resume workshop and more. This was an extraordinary learning experience and I have been blessed to learn from the experts at Google. It’s definitely something I will never forget and will always cherish. Jasmine Chin, Class of 2017, attended Bishop Kearney H.S., Bensonhurst.